We created our online rental service to offer the best prices and best value to our customers. To see how we’re keeping up with that goal, we researched the top services in our industry. Below is a breakdown of what we found, including our sources so you can see for yourself. In this section, we compare the pricing of a complete tuxedo rental with our competitors. We define a complete tuxedo rental as a package that includes: Tuxedo Jacket, Pants, Shirt, Vest, Tie and Jewelry. In every price range, National Tuxedo Rentals offers the lowest prices, whether or not you include the cost of a shoe upgrade. Tux ship comes in close on pricing, but it’s not a match – and their tuxedo selection only offers about half the number of styles that we do. In all other cases, our prices beat the competition quite significantly. 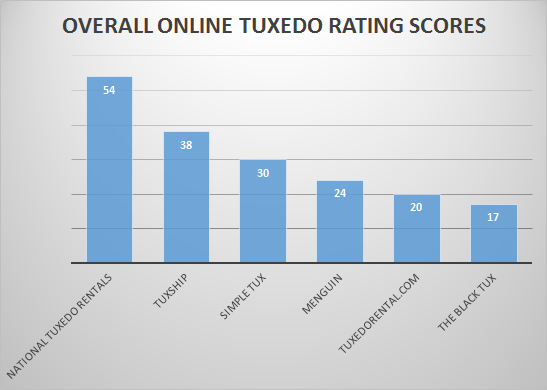 This section illustrates how we compare on selection of various tuxedo products with our competitors. Already off to a good start, we lead in every category above. How about on other products? In every category we carry more products than our competition. When you rent with our service, you have access to a huge selection of formal wear products. If you’re looking to rent a tuxedo, chances are that what you’re looking for is available in our massive catalog. This section shows how each service stacks up in terms of certain service policies, features and benefits. Analysis: Our shipping prices are not the absolute best, but they are fair. We offer free return shipping on all rental orders, and we calculate our shipping prices based on the weight and destination of your shipment. We feel that charging a fair price for shipping allows us to keep the costs of our products low, and our delivery policy of getting your tux to you 7-10 days before your event is best in class. 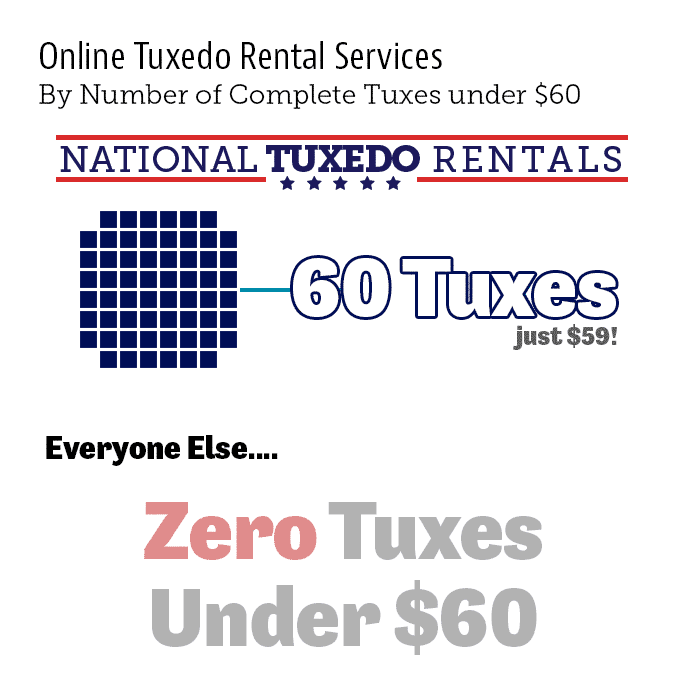 National Tuxedo Rentals is competitive with our fees. We are the only service without a late fee, and we only charge $5 per tuxedo for our damage waiver, which covers your tuxedo for typical use damages that may occur during your rental. Here you will find links to the sources of the information above that we used to gather data for these charts. We used several pages on TuxShip.com, but it appears that their web server is configured in a way that prevents us linking you directly to those pages. We can copy and paste the URL's here, but it seems they will only work from our computer - as they are tied to a session. Don't quote us on the exact technology they use, but all we know is that links we copy from their site do not work on any other computer than the one that was used to get the links. However, the only source we used for gathering information about tuxship, its products, and policies was their website: http://tuxship.com/ - and you are free to verify this information for yourself. This article was posted on Feb 06, 2015 .